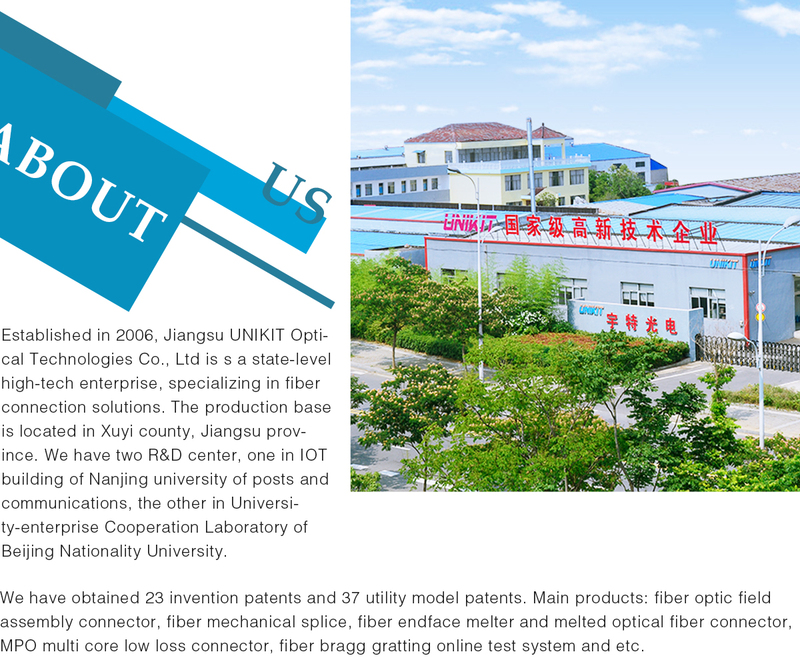 Jiangsu Unikit Optical Technologies Co., Ltd.
Jiangsu UNIKIT Optical Technology Co. Ltd. was established in May 24th 2006. Our company was set up based upon a strong Designing and researching team with many intelligent, innovative and aggressive people. Being with rich experience in the field of die mold designing and manufacturing, we design and produce the different kind precise optical fiber connecting parts to meet the requirements covered almost all main standard FTTH and FTTx engineering. Meanwhile we can also design and produce the parts for some engineering applications which are out of standard upon our customer's special requirements. 2. The optical fast connectors, the socket for FTTH and FTTx. 3. The different kind of plastic adaptors. 4. The combined splice, splitter and patch cord. All above mentioned products are with the excellent properties, which are widely to be used in the very worse circumstance such as high temperature, low temperature, high humidity, high pollutions, and the weather greatly vibrated. Our company is the first one who set up the enterprise standard for Optical Fast Connection parts in China. The Optical Fast Connector produced by our company is the first one in China, which passed through the testing of China national certification authority, named TLC. The testing include 20 items, which involve optical, mechanical, environmental tests and so on. Considering different kinds of the using environment in all aspects, our perfect designing therefore, enable our products reduced of failure rates in end using. It completely break out the monopoly of foreign company's products in this field. Now our company are making great more efforts to become one of the excellent supplier in optical communication products, especially in the field of optical fiber rapid connection for FTTx. 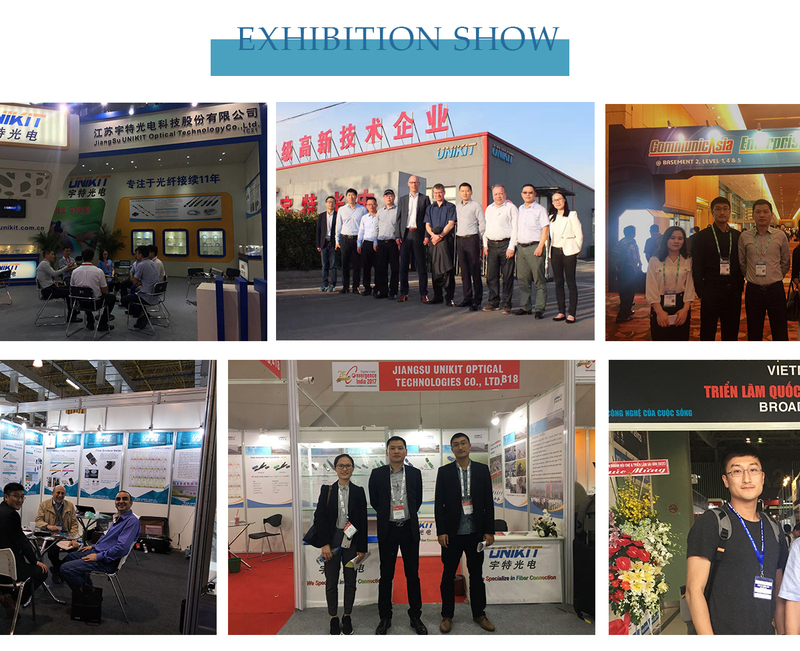 Based upon the advantages in leading technologies, high ratio of properties/price, and self D/R with own special knowhow property, our company's products are very competitive in the market of the optical fiber connector and splicer. Now our UNIKIT products are almost occupying 30% of China market in this field. And we have so many cases won in the projects for China Mobile, China Unicom, and China Telecom, which are the three main Tele communication business company in China. Also, more and more of our products are being exported to India, Malaysia, Singapore, Hongkong and some European countries. Our head office and factory are located in XuYu City Jiangsu Province. And we have also our own Scientific researching and designing institute located in Nanjing Post and Telecommunication University, the laboratory of the Institute is also one of the post-doc. work station of the University as well. Our overseas business department is located in Shanghai. We will not satisfy our available results, and will put more and more efforts in researching and developing our new technologies and new products to meet the market requirements in this field. That's enable our company to be a leader of optical fiber connection technology development both in China and abroad. We are sincerely looking forward to serve you with our high Tech. 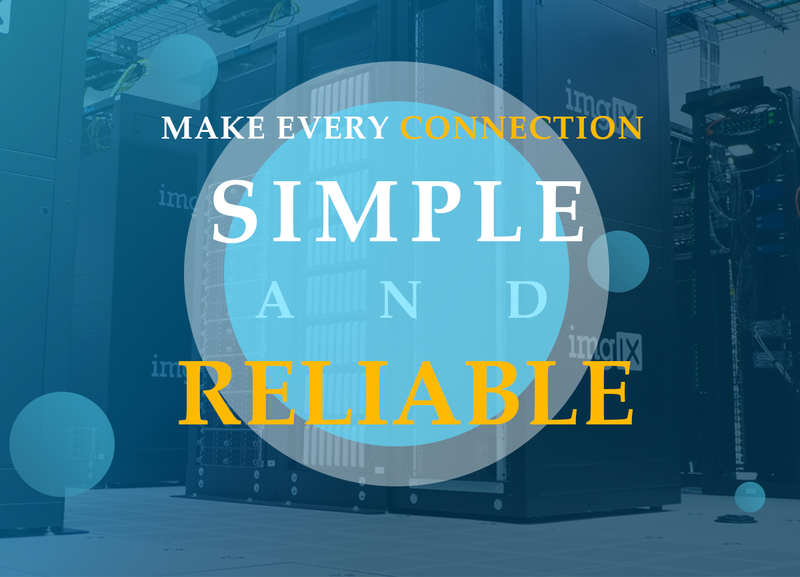 good quality products for optical Telecom Engineering solution.